Ander Herrera scored a brilliant second-half winner as Jose Mourinho’s side defeated Tottenham. The Spaniard celebrates putting Man United ahead at Wembley. Davinson Sanchez’s long ball picked out Christian Eriksen perfectly as Paul Pogba failed to track the Danish midfielder’s run down the right. Spurs failed to make the most of their early dominance, though, as Eriksen scuffed wide from Kane’s layoff before the England striker just couldn’t reach Son’s viscous in-swinging cross at the back post. Pogba has been a figure of frustration all season for Jose Mourinho, who has often left the £89 million ($125 million) Frenchman on the sidelines. And having showed the side of his game that Mourinho detests for Spurs’ opener, Pogba demonstrated his combination of physical power and technical ability as he outmuscled Mousa Dembele before delivering a pin-point cross for Sanchez. However, with Spurs only three defeats of 2018 now all coming at Wembley against the toughest of opposition in Juventus, Man City and now United, questions remain over Pochettino’s ability to turn Tottenham into trophy winners. Email “Herrera the hero at Wembley as Man United book FA Cup final spot”. 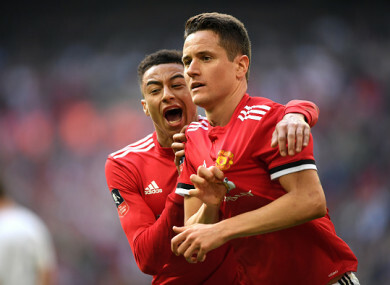 Feedback on “Herrera the hero at Wembley as Man United book FA Cup final spot”.